Did you know that the average lifespan of a blog is only 100 days? People lose their momentum, run out of ideas to write about, and give up. Don’t let your blog die after a couple months. That would be tragic. In this article, we’ll cover 5 free tools you can use to always be on the ball with finding fresh blog ideas. You’ve probably heard of or used Google Trends already — to compare search trends between two topics. It’s most commonly used as a reference point for interest over time. It’s also used for finding related search terms that have recently gained popularity. 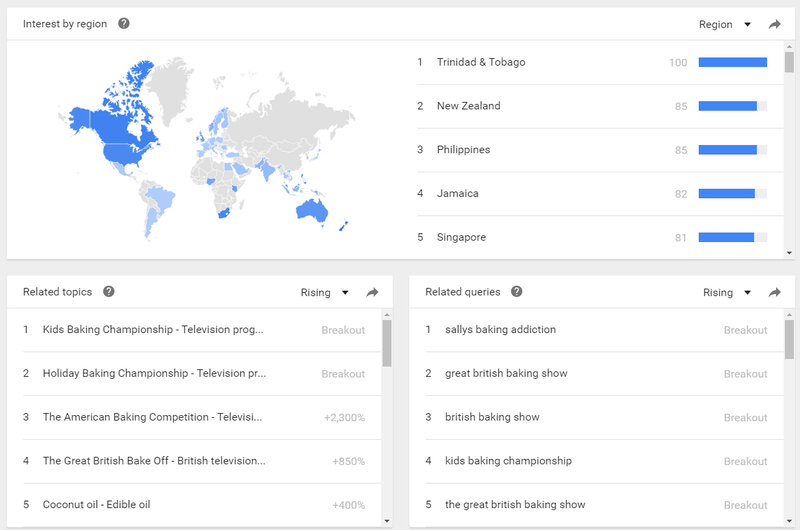 In this Trends search for baking, we discover the growing popularity of a British baking show. Google Correlate is the content writer’s best friend that you’ve never heard of. Think of Google Trends and Google Correlate as yin and yang. Instead of showing you interest online, it spits out data on terms associated with a keyword. It’s actually the only tool online of its kind, but we’ve hardly seen it talked about on marketing blogs. Maybe it’s a pro secret that we spoiled? Whoops. In this Correlate search for baking, we discover “sausage and” and “egg free” as potential blog topics. While it’s not a completely free service, the Open Site Explorer (OSE for short) allows you to make a limited number of searches everyday. This should be more than enough to spark your brain for creative blog article ideas. Moz OSE allows you to analyze the SEO strength of a website. An important aspect of using it to find blog articles is the Just Discovered tab. These are the pages on a website that have most recently been indexed by Google and are most likely to rank for keywords quickly.